We are happy to share another entry from our 52 Writers for 52 Weeks outreach. It’s been amazing for us to receive so many guest posts from people all over the country. Susan Boyles is retired from the US Army and a former small business owner. 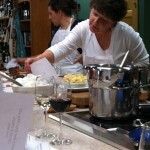 She is an avid cook who now teaches cooking classes in Wilmington, NC and a foodie who blogs at eatwilmington.wordpress.com. However, now she can add “aspiring author” to her resume. She is currently working on her first novel set in the South, where she lives with her four-legged companion, Buddy. Early in my life I was a babysitter, I worked the counter at McDonald’s, and I was a waitress. These were the things all teenagers did when I was growing up unless they had a paper route. That was what entry-level used to mean. I was more than shocked when I found myself exploring entry-level opportunities years later, as an adult. Back then, I graduated from high school and took the first bus out of town – to boot camp at Fort Leonard Wood, Missouri. After 20 years in the military, I ventured out into mainstream society via a brief stint as a civil servant. After a bit of floundering about, I started a business with my significant other. I was the managing partner of a gourmet kitchen store. 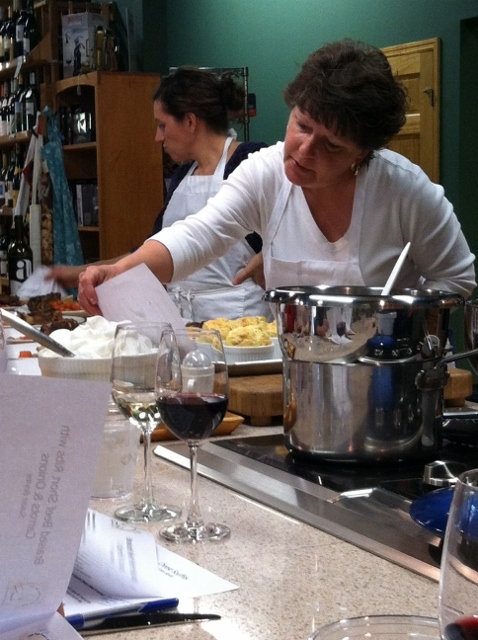 We handled inventory, selling pots & pans, and taught others to cook. Like most small business owners, I put my heart, soul, and every waking hour into the business. After three years though, our relationship fell apart. After three more years, I left the business to save my sanity. And here I am. Well, things have definitely changed as I found out on my recent journey from employed to unemployed! Where is here, exactly? That’s a very good question. Geographically speaking, here is Wilmington, North Carolina, where I have been for nearly a decade. It’s been about 11 months since I threw my life under the bus and set out to find myself…again. It’s the start of summer. As for where I am professionally, well I have no idea. For the first time in my life, I have no business card, no office. Save for a few brief moments when I was on vacation or under anesthesia, I have worked every day of my adult life while raising a child. And yes, she survived my intense work schedule so spare me the e-mails about working too much and motherhood. So when I stopped working, on July 1st of 2010, it was like someone flipped the switch and I was done. Nothing to do but clean the house, do lunch with a friend, or read. I don’t need to tell those of you who have also worked your entire life how long it took for me to get bored – almost instantly. I began to question the wisdom of leaving the business (briefly). I explored the possibility of having my own little bakery,since I love feeding people and had most of the needed equipment in storage. I was unable to find the right-sized place in the right location for the right money. I ended up a bit depressed for a while,not leaving the house for days on end, sleeping a lot, and in need of a hot shower. Instead, I gave myself a proverbial cold shower. I went to therapy, swore off alcohol, and set about trying to figure out who the real me is, and what she was supposed to do with all this time on her hands. I took a job as a middle manager at a grocery store – that lasted two weeks. I started crafting with seashells, thinking I might come up with some kitsch that would be the next hot selling item in home décor. When the rose-colored glasses fell off – about a month later – I started a blog. I continued to dream up other things I might like to do and quickly dismissed them. So I started selling off the bakery equipment one piece at a time. Only the ovens remain. Nothing I tried on for size fit. But I was still writing the blog and teaching cooking classes. Then it hit me: Perhaps the thing I am supposed to do with my life is already in front of me and I haven’t been paying attention. For as long as I can remember – before the kitchen shop, before leaving the military, possibly before entering the military – I have wanted to write novels. I have been an avid reader since I was big enough to hold a book and believe I have a few good stories in me. I dabbled with the start of several books over the years, but I always got stuck because my characters were heavily based on real people I knew or things that happened in my life. The problem with reality is it is boring and the outcome is not always what you hope. The options with real people are limited by, well, the people. Creating people out of thin air is way better. Shortly after that light bulb went on, a new story line popped into my head. Unlike my past writing endeavors, this concept has nothing at all to do with my life, past or present. It is pure, unadulterated fiction and it is a blast! I am researching the setting and some historical information to give authenticity to the story, but the characters are totally made up. I love making stuff up – who knew how much fun it would be? I soon began to realize that you could pursue your dream, no matter how long it’s been on the shelf. It’s never too late, my friends. I’m embracing this strange new lifestyle. I don’t know what I’ll be doing tomorrow. I don’t have a plan. I will probably write for a while in my new “office” (the living room). But I know what I won’t be doing. I won’t be going to work. I’ll probably just make it up as I go along. Anyone want to buy a Vulcan-Hart Double Convection Oven? I need the money to publish my upcoming novel.